Description: This was a dirty unit. Description: Someone added this unit to the site as a C44-9WL with the longer frame, that is incorrect as those units are in the 2500 number series and less than 25 were built. Description: Showing a good view of the new track layout. Description: CN 2671 South, #346 heads for Rugby Jct. Description: CN Dash 9-44CW on UP's ADESP-17. Title: Ready, cameras up, and...SHOOT! Description: Just part of the crowd that can be encountered at this popular railfanning spot on a weekend day. Description: Northbound CN with a wide load in tow. 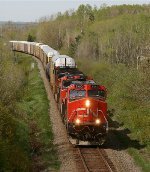 Description: Northbound intermodal on CN's Bala Subdivision approaching Warden Avenue crossing. Description: After a short chase, I was able to catch up to this northbound intermodal for another shot. Title: 407 With 2 Or 3 Big? Description: Unless you look closely, it looks like 407 only has two big, when really behind the tree...surprise, another! The chase was now on with 407.